Today in all vaishnava temples, in many hindu households and even in mylapore music concerts the hymns of the ‘nalayira divyaprabhandam’ are recited. Whether their meanings are understood or not it is an amazing fact that the same verses were recited in perhaps the same style 1200 years ago. The words have been preserved and have come to us unsullied, unaltered and with a little guidance can be easily comprehended. One man was responsible for this amazing act of preservation Nathamunigal the anthologist of ‘azhvar Pasurangal.’ He did what ‘Nambiyandar nambi’ did to the ‘Saivite Thirumaraigal’ and much later, what Swaminatha Iyer did to Sangam literature. Nathamunigal established an oral tradition of their recitation down the ages. He also gave them Vedic stature - ‘vedasamyam’ Nathamunigal was the first guru of the guru paramparai tradition, a continuous preceptor- disciple lineage, another unique practice in the vaishnava tradition preserved till today. The religion of ‘ubhaya-vedaanta-maarga’ (path of twofold scripture) is identified in ‘Tirumangai Aazhvaar’s’ (Tiru-nedun-taandakam 4) that the lord is “he that is of the excellent Tamil sounds, he of the Sanskrit word” (செந்திறத்த தமிழோச வடசொல்லாகி - திருநெடுந்தாண்டகம் 4). In this significant phrasing ‘Tirumangai’ affirms that the Tamil scripture has an autonomous divine origin along with Sanskrit. It was Sri Nathamuni (whose full name was Ranganatha-muni, born to Isvara Bhatta of Sottai clan in the Vedic lineage of ‘Satha-marshana,’ with the birth asterism of Anuraadhaa in the month of Aani-mithunam ~ occurs on June 30, 2004 this year) who gathered together the precious hymns of the Aazhvaar mystics and saved them for humanity in the Tamil scripture known as ‘aruli-c-cheyal‘ and as ‘divya prabandham.’ It is taken to be a sign of divine purpose that this revered savant picked up a clue to the scripture quite accidentally. Nathamuni was the finder of the treasure, and he did not keep it for himself. He told the world. you are my nectar! My body melts with love towards you. In ‘kudanthai’ of water filled paddy fields. My lord, I see your reclining body asleep, aglow. Even today if you read those ten poems you will feel the same way Nathamunigal did and seek the rest Natamuni was startled by the beauty of the poem and asked them where from they learnt those verses; the last verse they sang mentioned "this ten out of thousand" were there more? They did not know a sage in ‘Thirukurugur’ gave them. Thus began Nathamunis search for the rest of the verses this is the most plausible version. It is important to remember and cherish with gratitude Nathamuni’s passion which drove him to trek down from his native Kaattu Mannaar Koil to ‘Tiru-k-kurukoor / Azhvar Tirunagari’ in search of the other hymns. The lifetime of Nathamuni is indicated by S. Krishnaswamy Aiyyangar to be 823-917 ad and by M U Raghava Aiyyangar as 825-918, and we have to visualize how challenging and stressful it must have been for Nathamuni to have undertaken the long journey over what must have been difficult terrain. It was fortunate that Nathamuni met the second-generation disciple of Nammazhvar himself, parankusa-dasa, who imparted to him the ten-stanza hymn (Kanni-nunn-siru-t-taambu) dedicated by his preceptor madhura-kavi to his preceptor Nammazhvar. Nathamuni was a yogi par excellence. His renowned grandson ‘Aalavandaar-yaamuna’ personifies him as the ‘totality of Bhakti-yoga’. Parasara Bhatta applies to him the metaphor, Jnaana-jeemootam (= Nimbus of knowing) which is appropriate to one of Nathamuni’s spiritual power. Vedantacharya affirms that he held in his palm the substance of scripture. The poet ‘vadivazhakia nambi daasa’ describes him as one without a match for his penances. Pillai lokam jeeyar calls him a ‘parama-hamsa’, one of ultimate realisation. The poetic-esoteric work Acharya Hrdayam (no.115) says Nathamuni was verily like unto the swan manifestation the lord assumed when he imparted the veda-scripture to brahmathis is mentioned in svetaasva-tara upanishad; and Tiru-Nedun-Taandakam (திருநெடுந்தாண்டகம் - annamaay aru-maraiyai veli-p-padutta ammaann, அன்னமாய்... அருமறையை வெளிப்படுத்த அம்மான், Nathamuni seems to have gone to great lengths to play down his yogic proficiency. It was nevertheless plausible that the simple-sounding kanni hymn of just ten stanzas became a powerful spell (mantram) when recited and repeated by Nathamuni 12000 times, he could behold azhvar materialising before him in a vision, and teach him the entirety of the Divya prabandham corpus. It is not easy for us to imagine the extent and nature of the excitement, fulfillment and peace that Nathamuni must have experienced as he came by the object of his quest, the Divya-prabandham scripture. There is a beautiful precedent to this in the account of the Hebraic prophet mosses who “wrote upon the tablets the words the Ten Commandments; the skin of his face shone while he talked with” the lord (in the epiphany granted to him) ~ exodus 34. 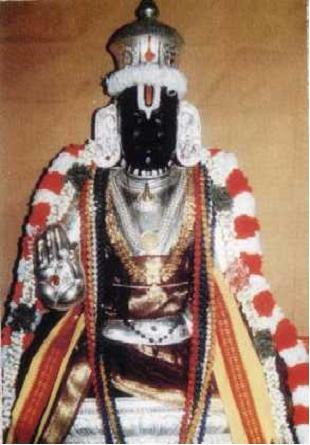 Sri Vaishnava guru-parampara, but also of the Sankara Sampradaayam (“narayanam padma-bhavam vasishtham” etc). It is, however, Sri Nathamuni who is acknowledged as the first acharya . Nathamuni, who installed the guru-lineage here on this earth, says the grateful Appillai. It was Tirumangai Azhvar who originally introduced tiru-vaai-mozhi also (in the great temple of Srirangam) in the festival of veda recitation (adhyayana utsavam) held annually from the eleventh day of the bright (sukla) fortnight of the month of maarkazhi / dhanus. Subsequently Nathamuni, in his time, enlarged the scheme of recitation to include the entirety of the (4000 verses of) Divya Prabandham. It was through this manner of canonization of the Divya Prabandham and the concomitant institutionalization of the araiyar-psalmodists, that Nathamuni ensured the preservation, learning and bequeathing of the precious scripture down the generations to come. His five disciples were, pundarikaksha (uyya-k-kondaar); tiru-k-kurukai-k-kaavalappan; his nephews of the west house and of the east house whom he taught to recite the Tamil scripture in the celestial music system (deva-gaanam) and appointed them as the araiyar (psamodists); and tiru-k-kanna-mangai aandaan whom he first equipped with the esoteric of the twin sacred formula (dvaya-mantram) before imparting to him the fine sensibilities of the Tamil scripture. Uyya-k-kondaar was charged with bringing up Nathamuni’s grandson yaamuna in the ‘sampradaayam’. Uyya-k-kondaar who sensed his own end approaching, did however discharge this responsibility without any deficiency, by deputing his own disciple Sriraama-misra (manakkaal nambi) on the assignment. Nathamuni’s school of eight-part yoga was represented solely by kurukai-k-kaavalappan on whose expiry, alas, it was lost. Nathamuni is said to have composed a few works in Sanskrit but they are not available. The next in succession was his renowned grandson-prodigy, yaamuna-aalavandaar who wrote nothing in Tamil, and is considered the father of the Sanskrit stotra-paatha (hymnal) literature. His stotra-ratnam contains literal translations from the Tamil scripture into sanskrit verse, and this precedent came to be readily adopted by all his successors, culminating in the versatile personality of vedantacharya. Yamuna’s immediate successor was Sri Ramanuja who wrote almost all of his nine definitive works exclusively in Sanskrit. The acceptance of the Tamil scripture by such ‘sanskritic’ personalities of great learning and long-time orthodoxy was not something ‘promoted’ (as we would say to-day) through any state pressure or by other vested interests. They had no mental barrier to overcome, and the Tamil scripture stood on its own in poetry, grandeur, philosophic content, humanistic values, and clear affirmations of godhead. Its divine inspiration was visible for all to see. The author of acharya-hrdayam (65) points out that Sri Ramanuja relied on the Dravida-veda to compose his Sri-Bhashyam gloss on the Brahma-sutra. This affirmation of scriptural validity has an echo in vedantacharya’s adhikaara-sangraham, where he says that his studious learning of the Tamil scriptures enabled him to grasp clearly the obscure regions of the veda-chhandas. While Nathamuni described it as an Upanishad of a thousand branches, Vedantacharya extolled it (dramidopanishad taatparya-ratnaavali, 130) as the scripture, which is benign to hear. The traditional accounts depict Nathamuni as invoking Nammazhvar in a vision at tiru-k-kurukoor, and receiving by Azhvar’s grace the entirety of the 4000-verse Tamil scripture. Tradition further suggests that, prior to Nathamuni’s recovery of the precious literature, there was a total lapse of ‘racial memory’ in respect of the hymnals of Azhvar-s.
One of the difficulties in traditional accounts of the lives of azhvars and acaryas is the mix of myth and fact usually the factual and historic content will be very little and the traditional account is totally believed. It is very difficult to demythify these traditional accounts. In fact it is not permitted. They are as sacred as the life of Christ or prophet Mohammed, not questioned. This attempt of mine to extract Nathamunis life from traditional accounts is likely to be criticized and I am aware of it. One incident in Nathamunigals life has to be true even if this has two or three versions the version closest to realism is this:- One day while worshipping lord mannanar in the temple in kattumannar koil he heard a group of travelers reciting a few poems they were great verses they happened to be ten poems from nammalwars thiruvoimozhi. The myth added to this sends Nathamunigal on a pilgrimage to the north there he hears these verses sees a light in the sky and follows it south to kurugur much like the biblical story of the Magi. A similar story is told about mathurakavigal also. Almost all religions need a leading light story for laymen. All myths are created like this and become more obscure down the ages the fact that Nathamunigal went south in search of the leymens is undeniable. That Naihamunigal “met” Nammazhvar and got from him the entire 4000 verses is also apocryphal and cannot stand much scruriny. It is rather difficult to believe that nammazhwar the silent sage who never left his seat under a tamarind tree had colleceted and collated threehundred years of poetry and simply handed them over to Nathamunijgal by a mental process. Nammalwar was the last of the azhvars. He is placed in the later half of 9th century according to epigraphic evidences Nathamunigal then must at least be a contemporary certainly not 825 ad. What is plausible is that Narhamunigal must have spent a lifetime searching recording arranging and setting to music and sometimes perhaps even writing the eleventh verse of each decade I am pretty sure traditionists will pounce on me for suggesting this Nathamunigal seems to have had some yogic powers too he had several disciples of which pundarikakshar was prominent. The mystery does persist about the non-inclusion of some ancient shrines in the traditional list of 108 shrines. These shrines as have been omitted were also possibly hymned by the Azhvars, but were not known to Nathamuni. Pandurangan’s view is that Nathamuni gathered the hymnal literature by visiting various parts of the Tamil-speaking country (to the exclusion of kongu land), and did not come by the entirety of 4000-verse Divya Prabandham corpus in a single spot and moment of revelation. This thesis need not be read as in conflict with the traditional account of revelation received by Nathamuni, for the entire history of discovery and of science is dotted with moments of accident and of unaccountable revelation which, to the believer, is a matter of the lord’s grace. The article reproduced (English edition of Narasimha Priya, July 2004 ) here is about Sri Nathamuni, written by Writer Sujatha and Co-authored by his brother T.S. Sundararajan.